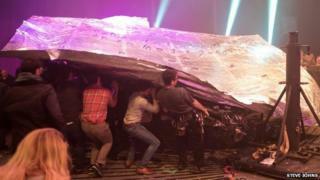 Three members of the public and a performer were injured when part of the set collapsed on to the audience during an acrobatic show in north London. Eyewitness Steve Johns, 68, said: "The sail collapsed on to technicians and members of the public below." A Roundhouse spokesman said the incident was "extremely regrettable" and it had cancelled Saturday's performance. Three members of the public were treated for minor injuries by London Ambulance and taken to the Royal Free Hospital. A spokeswoman for the Roundhouse said it was investigating what caused the collapse. Fuerzabruta's website describes the show as a "mind-blowing, heart-pounding international theatrical experience". Photographer Mr Johns, who was at the performance with his daughter and son-in-law, said 30 minutes into the performance "the sail which was spinning above the crowded floor on which acrobats were performing, collapsed on to technicians and members of the public below. "People were trying to get out from underneath. Fortunately, due to the efficient security service and the calm of crowd, the worst was avoided. "They have since emailed my daughter and said we will be offered reimbursement or the chance to see another show. But she said she wouldn't go again." A Roundhouse spokesman said "a piece of moving stage equipment on which two artists were performing suffered a technical failure and fell slowly into an area where audience members were standing. "The equipment was brought in for the production and was not part of the Roundhouse structure. "The show was stopped and the performance space was cleared immediately." Another eyewitness, Sam Joiner said: "We were about half an hour into the spectacular Fuerzabruta performance, when one of the big vertical acts, a sail-like structure with two performers on top - collapsed into half of the audience. "It was hard to work out what had happened at first, but we were quickly ushered out and it was clear something had gone very wrong." The spokesman added: "The Roundhouse is committed to the safety and wellbeing of its audiences and undertakes rigorous risk assessments for all of the shows that take place here."